Still now, for many forms of the disseminated cancers there is no curative therapy available. The discovery of novel active chemotherapeutic agents is largely essential to overcome this problem. 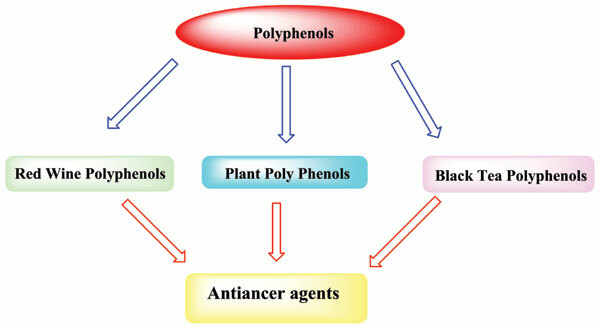 Natural compounds polyphenols are mainly characterized by a huge structural variance; they can render them intrinsic dietary components due to their common occurrence in plants. Now-a-days, polyphenols (secondary metabolites) are characterized by a vast spectrum of physiological significance. From the past twenty years in the world of scientific research, polyphenols play an important role in a wide range of physiological processess. This review focuses on the development of polyphenols as antitumor agent in recent research studies. Anticancer agent, cancer, chemotherapeutic agents, dietary components, polyphenols, significance.